Hands up who remembers never, ever wearing a track suit when riding on the road? True, way back when, the track-day barely existed and you had to really want a one-piece over the then trusty jeans and leather jacket combo you’d see zapping about the streets. And they were relatively expensive until the early 1990s when the cheaper end of the market began to drive prices of the more exotic fare downwards. Many of us here bought, for example, an Akito suit as their first. They were around £300 which back then was well priced, but still a heady outlay for the average rider. Many of them didn’t even come with Velcro for knee-sliders, and the in-built protection by today’s standards were just laughable. But you felt much safer wearing one regardless, and once you’ve gotten used to feeling like that it’s hard to go back in the other direction! We’ve never had it better than right now, especially as the cheaper suits on the market present superb value for money with near cutting-edge technology. And if you can afford the best, then you really have a choice to make as there are some fantastic offerings available including inbuilt air-bags. But the pertinent thing about the one-piece is that it tends to give one the very best chance of jumping right back up again after an off. Increasing your chances of doing that is, we’d venture, pretty priceless. Anyway, we’ve compiled a raft of example at varying price points for you to peruse – enjoy! While ARMR may not be as well known as the most popular brands, they’re building a strong name for themselves in racing paddocks – for top spec’ suits at far from top spec’ prices. The Harada R uses 1.2-1.4mm premium grade cowhide, and CE approved elbow and shoulder protection along with replaceable elbow-sliders. It has a breathable, removable and washable polymesh lining, is held together by TLS (Triple Lock Seam) technology, features an aero hump and uses pukka YKK zips to lock you in. Young spunker Carl races in these, and hasn’t been afraid to test the ARMRs out at times, giving a big thumbs up to their protective credentials. Available in sizes 40-46. 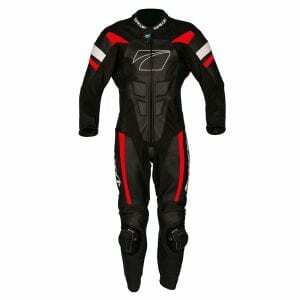 This Furygan suit, the ‘Full Apex Perforated’ uses full-grain 1.4mm leather and has, oddly, a removable aero-hump. 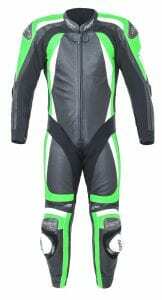 The suit is stuffed with D30 fully homologated protection on elbows and shoulders, and utilises aramid fibre reinforcement around the hips and botty areas for extra resistance and an aid against heat transmission. Triple stitching is used in places most likely to tear as reinforcement, while aluminium inserts are, erm, inserted in the shoulders and elbows. 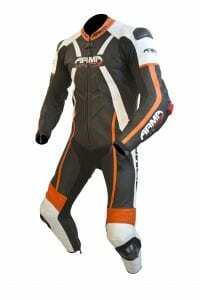 It has a hypoallergenic cotton lining and matching ‘racing underwear’ is available as an optional extra. It comes in white/black with red, green or yellow highlights, in Euro sizes 46-58. One of the cheaper options here, the Baracuda nonetheless comes with a decent specification. 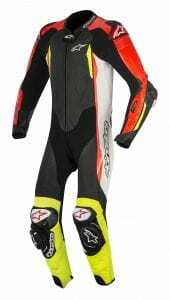 The leather used in its main construction is top quality based on a ‘racing’ ergonomic fitting, and like others here uses D30 protectors on elbows, shoulders and knees which can adjusted position-wise. 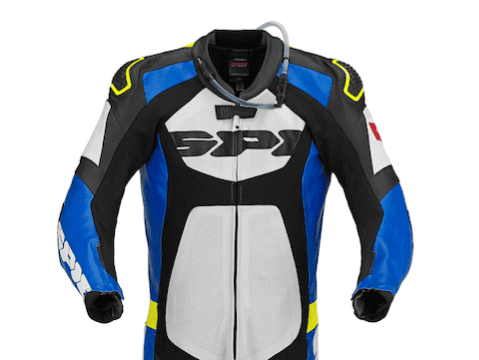 It also has a D30 back protector, a racing hump but no knee-sliders, which are sold separately. High risk zones feature safety stitching, and the right areas are perforated to keep you cool. Available in UK sizes 38-52. 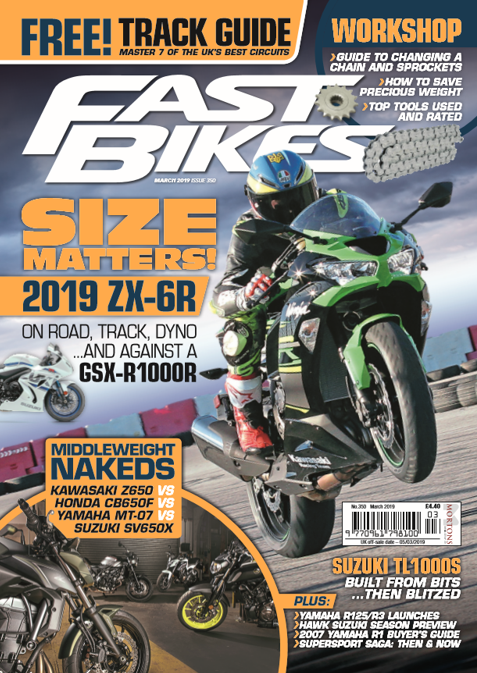 Developed using feedback from racers such as Ian Hutchinson, Richard Cooper and Alex Lowes, the CPX-C II moves RST right into the realm of the big boys – but still at a competitive price. And, no offence to Alex, but seeing how many times he spat himself into the tarmac in 2016 RST must have more crash data than they know what to do with! 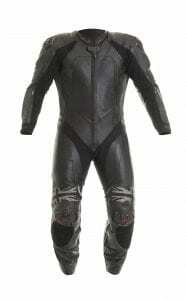 This suit is the result of the subsequent analysis, made from Mild Waxy leather, internally lined with a polyester SinAqua mesh which is removable and washable. It has CE approved armour everywhere, spare pockets for extra armour and an RST back protector, plus room for a water bladder in the hump. It has carbon cups on shoulders and knees, TPU sliders as standard and comes in UK sizes 38-50. Wolf is back in the one-piece groove once again, and this little number is a beauty in many ways. It’s made from a mixture of kangaroo and cow leather (40-60% respectively), and held together in both double and triple stitching with Oxley bonded nylon thread. 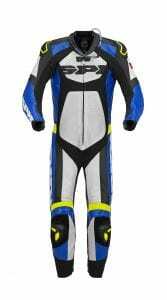 It features quick-release knee-sliders, a neoprene cuff plus racing comfort collar, and TPU shoulder and knee deflectors. Armour comes courtesy of level 2 CE approved D30 armour, zips are by MAX HD and the botty area is made from double-layer leather. Available in UK sizes 40-50. Another example of how the low-end of the price scale doesn’t mean a low-end product, Spada’s suits get better year on year. Fagan spent enough time trying his hardest to ruin previous versions, with little success, so the latest Curve shouldn’t be half bad, eh? It uses TEKTO CE six-piece armour in the pointy bits which also features leather reinforcement, has a dual density foam back pad and a neoprene race collar. Keprotec stretch panels keeps it flexible, and the Airtex lining keeps you cool and clean once it’s been hoiked out and washed. All critical areas are double or triple stitched and it comes in sizes 40-48. Built from ultra-fine Italian leather, the Tronic WP is crammed with CE certified biomechanical ‘Warrior’ armour where you need it most, and comes ready for additions such as the Warrior chest protector et al. It has removable elbow sliders for that quick trip to the shops, is ready to insert their Hydroback drinking system in the aero hump, features a removable and washable lining and has neoprene cuffs and collars. BJ has crashed in enough Spidi suits over his FB tenure to know the level of protection they offer, which could only get better with the addition of an airbag – which we should soon see as it’ll be compulsory in MotoGP soon. 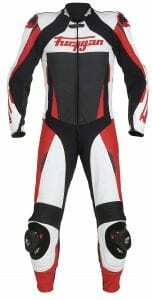 But at this price point, it’s about the best non-airbag suit around and comes in Euro sizes 46 -58. 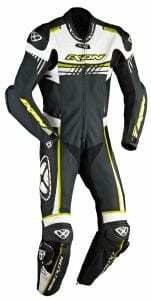 Ixon make some great suits, as worn by many a racer including the fastest ginger in the world, Bradley Smith. The Mirage is built from a mixture of cow and kangaroo hide, using double-thick leather on the thighs and posterior area, and is fully perforated where you need it. It features external shells on the shoulders, knees and elbows, and plenty of decent protection beneath those shells on the interior. A polyester lining which is removable and washable caresses your svelte (or otherwise…) form, and there are multiple extra layers of high-density impact foam distributed throughout, too. Available in sizes XS-XXXL. Yup, now we’re into the proper pricey buggars! But what a suit this is, and as you can see from the pictures here the airbag tech’ covers quite a bit of your upper torso. It’s made fully from kangaroo leather, with titanium highlights on the sticky-out parts. 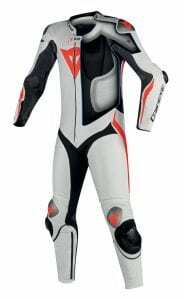 It also has a waterbag system, quick-release elbow sliders and Pro-Armor protectors on the hips and shoulders. It features a ‘Nanofeel’ lining which has been silver-ion treated, and the electronics for the tech’ lives in the aero hump. If you do set the system off it’ll need to be recharged. But, don’t fall-over and then try and say it went off by itself, the GPS unit already caught one wearer out who’d tried to claim that! Available in sizes 44-60. The other airbag entrant here is, unsurprisingly, from Alpinestars who (along with Dainese) have been pioneering the technology in racing circles for the last few years. So these two have stolen a march on the rest of the pack. 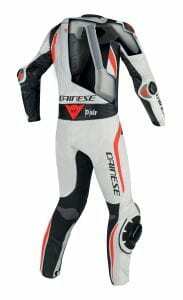 The suit screams pukka race cred, with an LCD sleeve display for airbag status, an overall construction of premium kangaroo/bovine leather and CE approved armour right where you want it. It features ergonomically engineered ‘Arshield’ reinforcements on the knees and sleeves, a waterproof internal pocket for your phone or wallet, and its ventilated aero hump has been redesigned for better slippage, and to hold a hydration system. Its price point isn’t too hard to swallow either, given the technology on offer. Available in sizes 44-58. *Prices noted are based on S or RRPs provided by manufacturers or their importers. Prices may be more or less (considerably less in some instances, check some links!) depending on the individual retailers. Previous Post:Ducati Launches ‘Link App’!